The Amber Elixir is a novella from the Two Realms series by Ariella Moon. 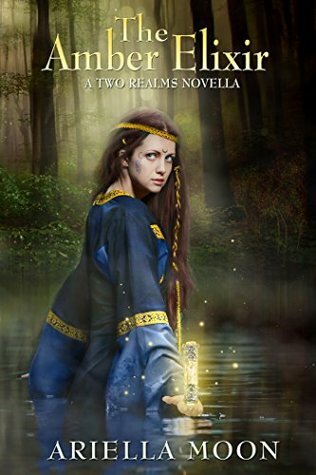 Set in Arthurian times, we follow the Lady of the Lake, Viviane, and her journey to undo the magic that turned two of her handmaidens to stone. There's more to it than that, of course, because we're also dealing with Merlin, Morgan le Fay, and even Queen Mab. The Amber Elixir, to me, felt longer than a novella. It actually felt like a full-length story that I wasn't quite getting the full length of, if that makes sense. At first I wasn't quite sure what I was getting myself into while reading the story, but things cleared up a bit the farther along into it I got. However, it does feel a little...incomplete. I felt like I should have already read at least the first book before diving into this one. That's just me, though. I did like the story for what it was, and even though I didn't quite connect with any of the characters, I did think Viviane was a good leader and protector of her handmaidens, and she seemed loyal and determined, too. As for the other characters, Merlin is kind of a jerk at times, but I suppose that's to be expected. Morgan le Fay is interesting. I liked her, but I wasn't sure if she was trustworthy or not. I actually think I liked Viv's handmaidens the most. They were young, innocent, but so full of an eagerness to learn. I liked them a lot. Plot-wise, the story stays pretty steady. There were a few spots in the beginning I felt were a little slow, but it picked up and stayed at that pace the rest of the way through the book. The ending didn't seem too rushed, although it did leave me wanting more. Overall, The Amber Elixir is a pretty decent read, and I'd be curious to see where the series goes. I might have to look into the first book so things start to come together and make more sense to me. I'd rate The Amber Elixir 3.5 stars. Sign into Goodreads to see if any of your friends have read The Amber Elixir.